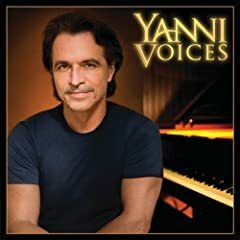 Life with Lesley: Yanni Voices CD hit stores yesterday! Earlier this month, I had told you about the Yanni Voices PBS Special. Well, yesterday the CD hit stores worldwide. And I was one of the lucky few that were given a chance to review it. I received the CD in the mail and my daughter immediately wanted to hear it. She doesn't know who Yanni is, and really if it isn't Hannah Montana or iCarly she has no attention span - but it was all about the excitement of receiving a package in the mail. :) However, I was excited to have gotten the CD. I had missed the television special and I was curious. This music was being compared to Josh Groban and Vanessa Carlson and these are great sounding artists. So I wanted to know if by Yanni pairing with these 4 new faces - Chloe Lowery, Ender Thomas, Leslie Mills, Nathan Pacheco - he would actually make a splash. It was wonderful!! The lyrics, the melodies, a touch of Spanish - combined together with Yanni's brilliance and 4 new voices I was blown away. I would highly recommend you checking this CD out - go to a website like Amazon.com and on the product page you can listen to samples of the music. Do it!! Track #4 Never Leave the Sun is my fave right now.